How to Help Someone Coping With Grief? There are no rules when it comes to grieving. Grief takes its own path in each person, whether it goes quickly or drags on for a long period of time. There are different stages of grief, but they, too, can be fickle. Some people may skip a stage or two while others will remain in one stage for the duration of their grief. Since death is a part of life, grieving is a part of losing someone you love. While there is no magical solution or certain path to follow to help you recover from grief faster, there are small things you can do to help yourself or a loved one get through the process quickly and easily. Nothing about grief is easy, but you need to be true to yourself while you are grieving so as to not make things harder than they already are. 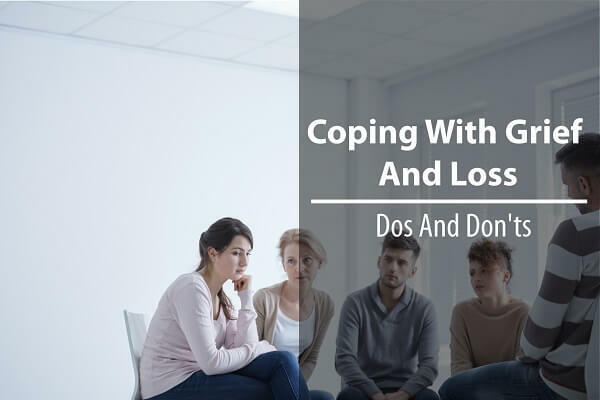 Here are some dos and don’ts in relation to grieving, whether you are the one grieving or you are trying to comfort someone in grief. When you are grieving, it’s good for you to accept the fact that nothing you say to yourself is going to make things better. That will allow you to abandon your efforts to perk yourself up with simple thoughts. If you are watching a friend grieve, understand that nothing you say can make their path to peace easier. When you speak with someone in mourning, keep it simple and heartfelt. Tell them you are sorry for their loss and let them know you are there for them if they need any help during their difficult time. Bereaved individuals don’t expect anyone to be able to calm their grief with their words. Spending a lot of time trying to figure out something to say is a waste when no one can fully understand what the bereaved is experiencing. If you are grieving for a loved one and there are other family members grieving for that same person, there’s no way for you to assume that what you feel are the same emotions experienced by them. Perhaps they are closer to the family member in question or had a different kind of relationship with him or her. Others feel grief in different ways and because you feel a certain way doesn’t mean those around you feel it as well. In addition, if you are attending a cremation service to support a friend, you can’t assume you know how they feel and you shouldn’t say much. Even if you have lost someone too, you may not realise what this particular loss means for the person in mourning. Avoid personal statements because no one can know what the bereaved feel except for each individual in mourning. It’s hard to find the words to express what you need when you are grieving and there’s nothing wrong with that. Not everyone will want to talk about their feelings and not everyone will be comfortable hearing about yours. When you need comfort, it’s perfectly fine to reach out to those around you for a hug or a shoulder to cry on. Many people aren’t going to know what to say, but anyone can wrap their arms around you and give you a pat on the back. A simple hug can give you the support you need to make it through the most trying times. When you attend a memorial service, feel free to console your friend in mourning. Give them a tight hug so they can feel your empathy. Sometimes, saying nothing at all and simply physically being there for the bereaved can be most beneficial. Nothing can hurt the family more than those within it imposing their beliefs on others. If you believe in God and feel your loved one is in heaven, keep that to yourself. But you shouldn’t impose those beliefs on others during their time of grief. Some people will accept a death as part of God’s will, but that can be very disheartening for others to hear. Likewise, if you are attending a memorial service with your own set of beliefs, you shouldn’t voice them towards those who are grieving. Some people will be angry with God and it’s not your place to try and calm their anger or set them straight. What you believe during this time isn’t important. It’s more about what the bereaved are feeling and how you can comfort them with your presence. Death isn’t easy for anyone and everyone around you will understand that. When you are grieving about the passing of someone, it’s perfectly natural and acceptable for you to express your emotions in whatever form you feel best. That might mean crying, sharing memories, talking about your loved one, or venting your anger over their death. Getting these emotions out can help the bereaved lead themselves to the next step in the recovery process. If you attend a memorial service after a cremation has occurred, bring a listening ear. Your willingness to hold someone while they are crying or listen to them share memories can be the best gift you can give them during this difficult time. You don’t have to have answers, but rather encourage those grieving to be patient with themselves as they vent their emotions. There is no right or wrong manner to hold funerals and memorial services. While families can choose between traditional funeral services, or burial and cremation options, both are perfectly acceptable and respectful in today’s society. If you are not in charge of the memorial service or final disposition, don’t voice your opinion as to what should have been done or what should have been avoided. Simply go along with the plans that are laid out and use them to get closure and move on with your life in the new environment. There are many rules and traditions around final service that simply no longer apply and bringing those up now, when it is really too late, will only make others in the family feel bad. When you are coming into another family to support those in grief, accept that they might do things differently than your family. There’s nothing wrong with that and expressing your differences at this point in time is not appropriate and won’t help anyone at all. It’s often comforting to those who are grieving to talk about their loved one who has passed on. It’s okay to bring up fun memories or times the person did something that you remember. It can help you to talk about them and it can help those around you remember them in a new light. Sharing memories can help you gain access to stories others might have about the person that you’ve never heard before. If you come to a memorial service and you have memories of the person who passed on, share a brief story with someone in mourning. They will appreciate that you have fond memories of the person and it will make them happy to hear something new or something they adored about the person. When you are grieving, you need to let yourself grieve. And while you don’t necessarily want to dwell on the dark parts of death, it’s okay not to look for positives. There aren’t positives in every situation in life and when you lose someone you love, covering up their loss with something ‘positive’ isn’t going to help. Those who attend the cremation services should also note that pointing out something positive in regards to the death isn’t going to help those in mourning. You could say that at least the person isn’t in pain anymore or that they are in a better place, but be careful not to cover up your emotions with these thoughts. The bereaved will hear this over and over again from others and it doesn’t help and can also cause them to feel bitter towards the person saying it. All they really want is to have the person they lost back. Nothing else will feel positive since they can’t have that. When you are grieving, it can be very hard to pick up where you left off and move on with your everyday life. You might find yourself unable to sleep or with no energy to cook. You might not want to go out in public to do your regular errands because of what you have experienced. There are going to be friends and family members who offer to help and while you’d like to push everyone away, tell them you’re fine, and carry on like normal. Don’t ask for help until you are ready to interact. The people around you want to find ways to help so when they offer to pick up groceries, bring you a meal, mow your grass, or do other such tasks, let them if you feel comfortable. You are giving yourself the break you need to concentrate on your grief and you are allowing them to help you. As you attend cremation services to support friends, it’s always nice to offer your help in some way or another. Understand that it’s very hard to accept help from others. If you tell them you’re there if they need help with anything, that’s very nice, but they likely won’t call you and ask. Instead, think of something specific you can do and then stick with your plan to carry out the task for them without asking too many questions. With grief, there are going to be good days and bad days. On the good days, perhaps you will only think of your loved one a few times and cry once. On the bad days, you may not feel like you can get out of bed. Grief has ebbs and flows and it’s all part of the process. There are some days you know will be bad, like the day of the memorial service, the day you scatter the ashes, an anniversary or birthday, or the holidays. You can do a few things to ease the grief on those days, but overall, you know bad days are coming. When you have one bad day, don’t expect the next day to be more of the same. Appreciate the good days when they come and understand there are more of those in your future. As a friend helping someone through grief, you need to be flexible toward the good and bad days. If you invite the friend for coffee on a good day, you might enjoy your time together. Another time, they might be in a sombre mood. Support them no matter what type of day they are having. Just because a person has passed on doesn’t mean they have left your life in every way. You still have your memories in your photographs stored around the house to remind you of the good times. You have no reason to remove photographs unless they make you uncomfortable. You don’t want to take them out of your life completely and having their pictures nearby can help. As a family friend, it can help when you remind the loved ones of their departed family member. Share your own memories with them when you see the pictures in their house or comment on what a happy day it was when the photo was taken. Don’t encourage them to move on by taking things down. While you probably have other people in your life that love you, you never want to try to replace someone you lost with someone else. If you have lost a child, don’t get into the mindset of ‘well, at least you have other children.’ When you lose a grandparent, don’t substitute the time you spent with them on another grandparent trying to replace the person with something else. In order to adjust to the loss, you’re going to have to get used to a new sense of normal, whatever that looks like. When you approach someone who is grieving, never comment on the people they still have in their life as a way to brush off the person they lost. While they may still, for example, have a sister living, even if one passed on, it’s nice to suggest that they be thankful for those they still have around them. Grieving takes time and there’s no set timeline for recovery. You have no guarantees that you will feel better next week, next month, or even next year. Allow yourself to move through the process at your own pace and try to take care of yourself as best you can naturally. Get adequate rest, eat healthy meals, and move back into your life as you see fit. Treat yourself well and don’t get down on yourself for how you feel about the loss you are suffering. As someone supporting a person in grief, show your concern for them, but don’t bring up the loss every time you see them. Allow them to tell you how they are feeling whenever they need to and be there for them to express their anger, guilt, and sadness. Plan your visits with them when you know they are going to have a hard day (i.e. so you can help them out), but be patient with them and don’t push them into going back to their old lifestyle before they are ready. There’s nothing you can say or do to help yourself get through your grief any faster, but keeping track of a few dos and don’ts will make the process slightly easier as you move through the stages at your own pace. If you are supporting someone who is grieving, understand that they are having a hard time and the best thing you can do is be there for them in whatever capacity they need you. That might look different to various people and it can be hard to figure out where you fit in. The professionals at Fixed Price Cremations are here to help you with direct cremation services so you can say goodbye to loved ones in a proper and honourable manner. The experts also have grief resources to help you through the stages that come along later. Have you ever helped someone through a grieving period? What did you find worked or what mistakes did you make that you wouldn’t do again? When you grieve a loved one, is there anything you can do to ease your pain or how have you found your way through the process and to the other side, into a ‘new normal’?